As the weather gets better the kids want to spend more time outdoors but doing the same old thing each day can soon lose the fun factor. Remember to follow your child’s interests and let that lead you to what they want to be doing. 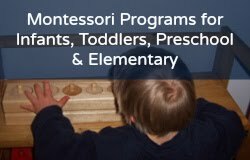 Here are some of our favourite outdoor activities, which are versatile, Montessori inspired and fun! Going on a nature walk doesn't mean you have to pack up and head for the mountains, nature can be found right on the door step even in built up areas and big cities. Instead of rushing everywhere, take it slow, toddlers are especially good at this and will stop and notice the small things like a trail of ants. Take you time and look out for all signs of nature on your street, look for plants and bugs, collect samples (but not from a neighbours garden!) and talk about what you find. PL can be a lot of fun outside, such as doing the laundry - you can set up a mini washing station and washing line and wash the dolls clothes or smaller items such as socks by hand then hang them to dry. Ice cooking is always a favourite with my son and his friends. Supply them with some different sized bowls and jugs and kitchen utensils. A big bowl of ice and a jug of water and they will cook to their hearts content, practicing all those handy skills such as pouring and scooping whilst they are at it. An obvious one here is making mud pies, hours can fly by when making a cake shop full of mud pies and cakes. Getting the child involved with the gardening, from planting seeds to pulling weeds and of course harvesting the fruit of your labours. Cooking! There is nothing quite like coking on an open fire, there are many simple camp recipes you can try, of course s'mores will always be the favourite. Outside is a great place for sensory exploration. If you have a herb garden, take a few leaves and ask the child to smell one then go and find the plant it came from, without looking at the leaf that they are smelling. Free play with rocks, stones, small branches and shells are also lovely ways to incorporate the senses. If your child is going through a period where they are fascinated with numbers then use the things that you find to do simple math sums using shells, sticks, leaves etc. as counters. Make a measuring stick from a small stick or branch and then have fun measuring everything they find. 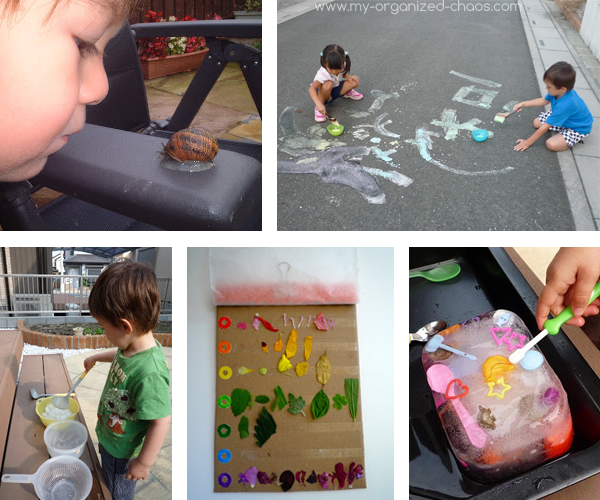 Lots of experiments can be done outside and it is perfect for investigations. Grab a notebook, pencil and magnifying glass and see where discoveries take you. If your child doesn't usually do art outdoors, the experience alone will excite them. Take a walk around the park and find a nice spot to sketch or paint or do a nature study of a specific plant or insect. Using clips to stop the paper blowing up is a neat little trick and will stop your little artist from getting frustrated. Great activity to do with a picnic and can be a good introduction to some of the great artists such as Monet. Sidewalk chalk is also a versatile activity where you can do anything from drawing to making mazes, shadow art, math and games. Pack up a picnic and a pile of books and head out to somewhere relaxing for a couple of ours al fresco reading. Write a poem about something you have found. Brainstorm words to describe what you can smell, see, feel and hear. Jo Ebisujima is a no nonsense organizer and child wrangling expert extraordinaire, who believes that a child’s number one teacher is their parent and that its a parents job to help their child fall in love with learning. She is the best selling author of Montessori Inspired Activities For Pre-schoolers and is also the founder of My Organized Chaos; where she helps busy mamas organized their home, kids and themselves so they have quality time to do the things that they love. Get started today with Jo’s free playbook: What Macgyver would do if he had kids. Organizing tips and tricks, parenting help and fun ideas! Then find Jo on Pinterest.